All players are on the ice and they line up as shown for each position. 1. Forward line comes to center ice. 2. On whistle players follow patterns as shown. 3. Especially to the younger age groups stress the importance of timing. 4. Make sure they are watching the play develop and they are not just following their pattern and getting too far ahead of the play. 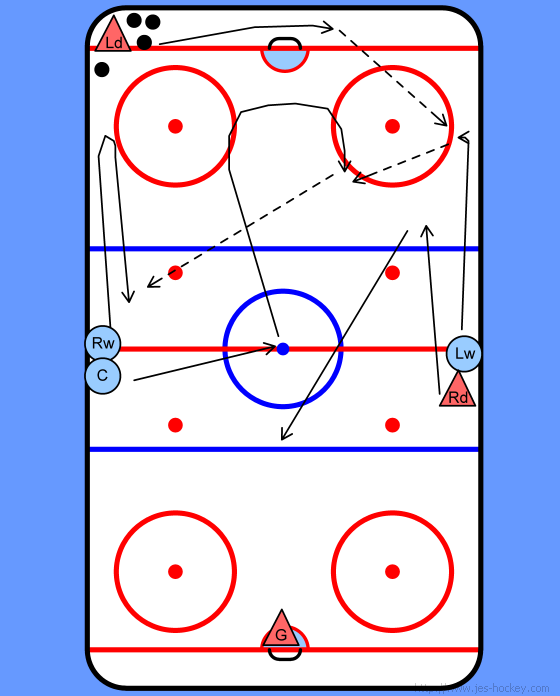 -Switch defense and work on the other side - RD passing to RW. -have them practice the triangle offense during 3 on 1. -if something isn't working whistle it down and explain it immediately.